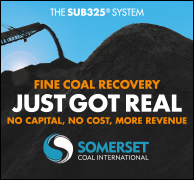 September 4, 2018 - Coal could be coming out of the ground as early as next month at what is described as the largest current development in the commonwealth's anthracite region. The rain has to let up for that to occur, Gregg Driscoll, president and chief executive officer of the Blaschak Coal Co., said Tuesday. 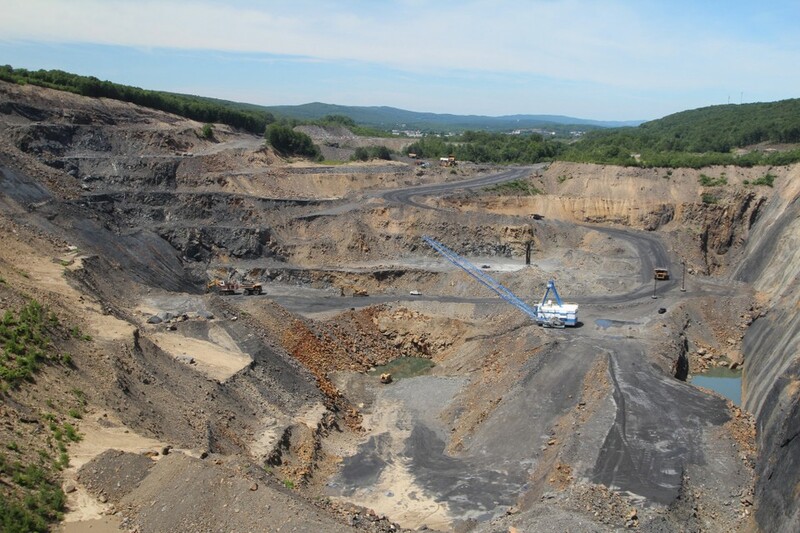 The company, based in Mahanoy City, is in the process of reopening an old surface mine north of Route 61 between Mount Carmel and Centralia in Columbia County. "We're excited about it," he said. The borough of Mount Carmel is partially visible in the background of this picture taken in late June. Photo by Blaschak Coal Co. The state recently approved a $1 million Redevelopment Assistance Capital Program grant to help fund the project. The company sought $4.5 million. Blaschak, owned by Milestone Partners Inc., a Radnor-based investment firm, expects to spend $13 million to reopen and provide equipment for the mine, Driscoll said. It already has invested a little more than $10 million, he said. Preparation work includes removing material placed in the pit by the owner, Mallard Contracting, as part of a reclamation process, Driscoll said. Blaschak has signed a 20-year-lease with the Helfrick family that owns Mallard and anticipates mining between 200,000 and 300,000 tons of ready-to-burn anthracite annually, he said. The coal will come from what is known as the "mammoth vein" that is 80 feet thick, he explained. It is one of 13 or 14 seams of coal in the anthracite region, he said. Between 25 and 30 United Mine Workers Union members earning in the range of $65,000 to $85,000 a year will staff the facility, Driscoll said. "It's a good living wage," he said. Some of the employees are coming from a closed mine near Centralia, he said. It will provide them with continued employment, he said. "Anthracite has been an important part of the economy and culture of the eastern mining region in Pennsylvania for 200 years," Driscoll pointed out. "Anthracite is used differently from bituminous coals and has both energy and non-energy uses. 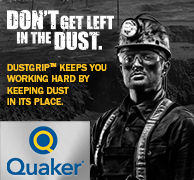 "We are excited about the future of anthracite mining and distribution in Pennsylvania and see continued growth as a real and meaningful economic and environmental benefit to the region," he said. In announcing the grant, Gov. Tom Wolf said the mine will provide a considerable production of high quality anthracite coal for more than 20 years. "As mining progresses, the land will be reclaimed and made available for alternative uses in the community," he said. "Wages for the created jobs more than double the median household income in the region." Blaschak's goal is to leave the site looking better than when it arrived, Driscoll said. That tricky balance is seen particularly in Nigeria, where coal is abundant and cheap yet some 54% of the country’s 190 million citizens lack access to electricity. The country has a plan under way to deliver power from coal-fired plants to more of its people. Today, Nigeria generates all of its power with a mix of hydroelectric dams and natural gas, but frequent vandalism of pipelines causes power shortages. By 2030, Africa’s biggest economy plans to add 30 gigawatts of power, of which about 30% will be produced by renewable sources and about 3% will be from coal. The project will cost about $3.5 billion a year. The World Bank approved a $350 million loan for solar mini-grids and other equipment to provide electricity in Nigeria. But the bank has said it would no longer finance projects involving coal—anywhere in the world. Bank officials say countries looking to fund coal ventures should look to the private sector. There are some 2 billion tons of coal in the country, according to estimates, and economists say putting it to use to spread power could be a boon for the economy. Many emerging nations are fighting similar issues, even as more prosperous countries such as the U.S. and the U.K. have reduced the use of coal to produce electricity. On the Asian continent, home of the world’s largest coal reserves, China and India account for most of the growth in coal use. Vietnam plans a fivefold increase in its coal capacity through 2035, according to the Clean Coal Centre, a division of the IEA. Bangladesh plans to use coal to generate 50% of the country’s power by 2030, up from 2% today. Like many countries in the region, it is funding its expansion with loans and technological help from China and Japan. Toshiba Corp. and other partners are building a coal power plant and port on Matarbari Island in Bangladesh. The project will cost about $4 billion, with most of its financing coming from the Japan International Cooperation Agency. Some countries looking into coal-expansion plans are hoping the Trump administration will take a pro-coal approach to the 2016 Electrify Africa Act, which set aside funds for energy projects on the continent without specifying a preference for how power is generated.